A thoracic epidural steroid injection (cortisone shot) can provide you with immediate relief for a wide range of painful conditions in your upper and middle back. Common conditions such as neck pain and shoulder discomfort often are relieved after one or two cortisone shots. Your NYC sports injury and pain management doctor provides this treatment in his Midtown New York City office for your convenience. Our sports injury clinic in NYC is certified and approved and is among the best pain management clinics in New York and the region. A thoracic epidural steroid cortisone injection is a treatment designed to relieve pain in the upper to middle back as well as the shoulder areas. The specific pain could result from severe inflammation or a pinched nerve in the thoracic region of the spine, which comprises your upper and middle back areas. Thoracic epidural cortisone steroid injections are used to reduce inflammation in the affected area and provide pain relief. The cortisone injection itself is a way to deliver steroids and anesthetics right into the nerves in the spinal roots, providing an immediate pain relief effect. Your Midtown Manhattan sports medicine and pain management doctor uses the cortisone injections as temporary pain relief to give your body time to heal. The thoracic epidural steroid cortisone injection (cortisone shot) is highly effective and significantly reduces pain more than 50 percent of the time. Back pain is one of the main complaints your NYC doctor hears for a wide range of reasons. Whether you’re an active weekend golfer, a professional athlete or a worker who sits in front of a computer all day, you can develop thoracic spine pain. Prepare to give your New York doctor details about any trauma you may have had recently that seemed to coincide with your back pain. A thorough history of previous back problems and your level of activity also help him reach a clear diagnosis. Diagnostic tests may include x-rays, CT scans or MRIs, which can help your doctor rule out other causes of pain, such as tumors. If you’re pregnant, taking blood thinners or have an infection, you also may not be eligible to receive a thoracic epidural cortisone shot. The procedure is beneficial for all kinds of diagnoses that include upper back pain, middle back pain and back injuries that cause thoracic back pain. You’re asked to lie on your stomach on a fluoroscopy table that provides real-time x-rays to help your doctor accurately palace the needle. You may be offered a sedative to relax you during the procedure if you’re nervous. The area of the cortisone injection site is then cleansed and sanitized with an antibacterial solution and prepped for the initial injection. A numbing agent is applied to the cortisone injection site so you don’t feel the needle. The numbing agent might give you a slight sting. 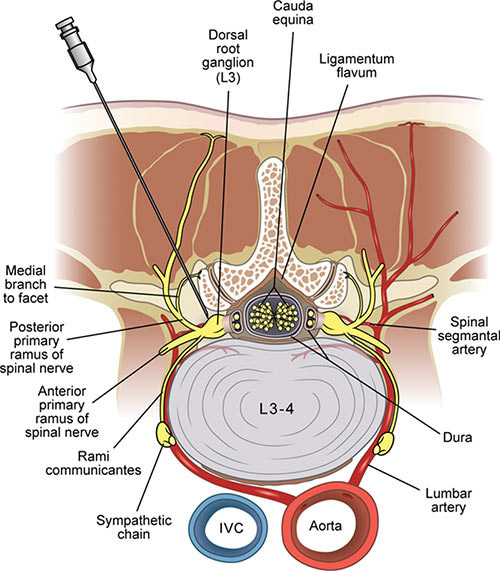 Next, the needle with the medication is injected into the spot deemed to be the source of your pain. The entire procedure very often takes just 10 minutes or less. After the procedure, you’re asked to stay in the recovery room anywhere from 15 to 60 minutes for observation. It’s normal to feel slight discomfort or soreness in the area of the cortisone shot. An ice pack at home for the first day or two helps alleviate this soreness. Within about 48 to 72 hours of your thoracic epidural cortisone steroid injection procedure, the effects of the treatment begin to take effect. You receive the intended relief in the injured part of your spine. Follow-up appointments are necessary with your Manhattan pain management doctor because thoracic epidural steroid cortisone injections typically are done in a series of three shots, each about two weeks apart, depending on the severity of your pain and the success of the first epidural. Do you have any questions about the thoracic epidural injection or cortisone shot we offer in NYC? 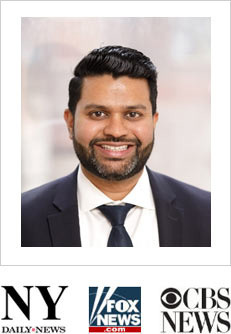 Would you like to schedule an appointment with the best rated NYC back pain doctor Febin Melepura MD of sports pain clinic NYC? Please contact our office for consultation with the top pain relief specialist in Midtown Manhattan.